Photo by Jim Harmer. This specific spot is in the Really Good Photo Spots iPhone app if you'd like to go shoot here. It's near Swiftcurrent Lake in Glacier. Glacier National Park is a nature photographer’s paradise. The dramatic, jagged peaks, and harsh topography provide photographic angles and compositions that are limited only by how far you are willing to hike or how high you are willing to climb. Glacier also offers wildlife such as black and grizzly bears, mountain goats, bighorn sheep, mountain lions, elk, and more. I recently made a trip there with some Improve Photography readers and writers and want to highlight a few great areas to photograph. While there are endless areas to explore in Glacier, I have limited many of the following locations to those accessible by day hiking for people with an average level of fitness. 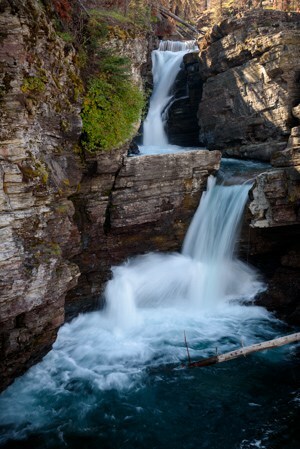 With that said, I give you the photographer’s guide to Glacier National Park in Montana. 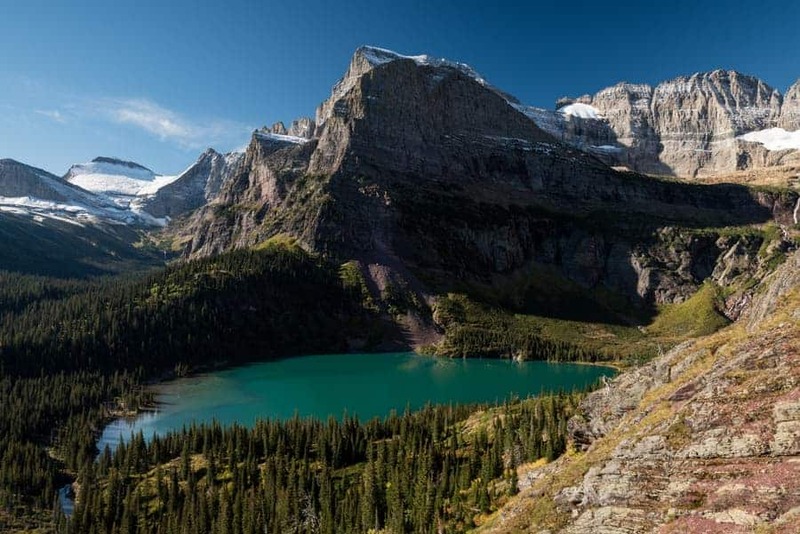 Glacier National Park is a location that experiences harsh winters and mild summers. The Going-to-the-Sun Road, which traverses the park in a general east-west direction and winds along many of the most picturesque views in the park, is typically only fully open from approximately mid-June until mid-September. 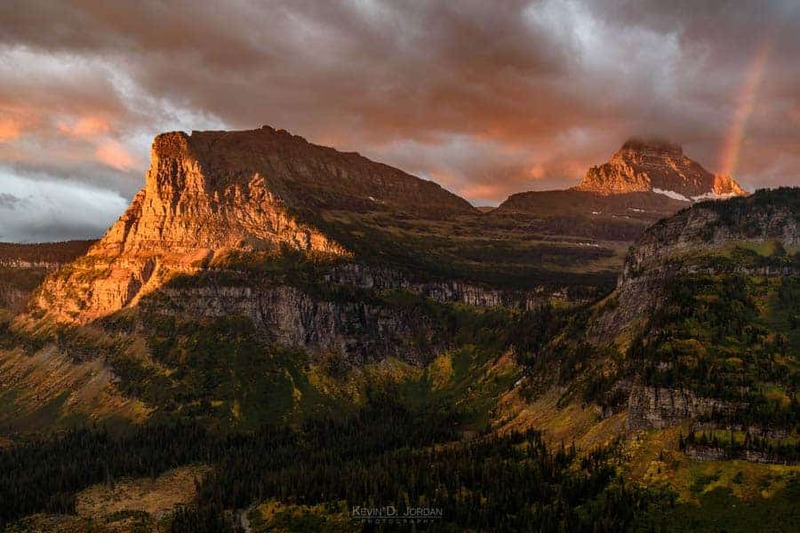 Therefore, if you want to be able to drive this road, take in the views, and easily access the many hikes and photography locations that are connected to the Going-to-the-Sun Road, a summer or early fall trip will be what you want to target. Early summer will result in snow-capped peaks and gushing creeks and waterfalls, while mid-to-late summer will yield high elevation wildflowers. My personal recommendation would be to go in mid-September, when fewer tourist, fall colors, a possibility of snow-capped mountains, and reasonable sunrise and sunset times (about 7 a.m. and 7:30 p.m., respectively) all come together. This article is somewhat obsolete now. Since posting this article a year ago, we released an iPhone/iPad app of all the best places to photograph in Glacier National Park (and around the world). It' s a free app called Really Good Photo Spots and you can download it right here. All of the spots in this article are in the app, but also there are MANY MANY more in the app than in this article. The app is essential for photographing Glacier because you can just tap “Spots near me” at any time while out shooting and BOOM! You see all the best spots to take pictures near there. It's pretty cool. The only limitation is that you may not have internet on your phone in many spots in Glacier. The app is free, but you have to pay a few dollars to be able to use the data off-line. Small price to pay for something that could really improve your trip. For photographers trying to maximize their ability to see a variety of photo locations, Glacier is best traveled at least in part with a car. 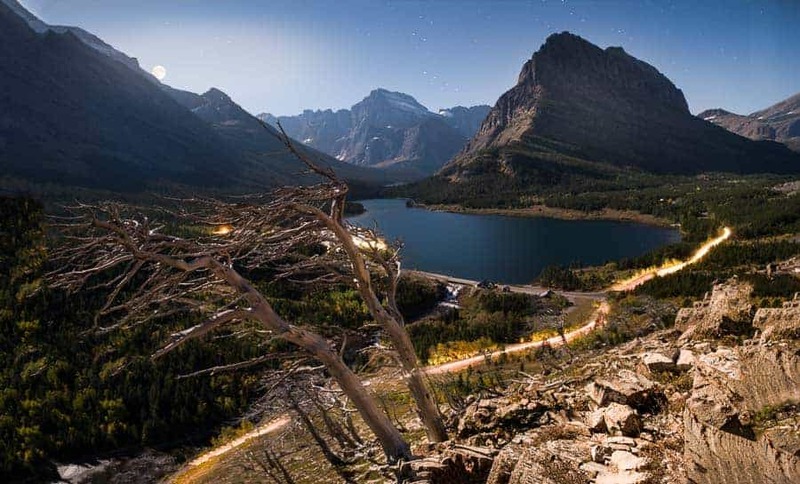 Many of the best photo locations are situated in the eastern half of the park, so staying in lodging or campgrounds in an area like St. Mary provides easy access to the Going-to-the-Sun Road, as well as relatively short drives to picturesque areas such as Many Glacier, Two Medicine Lake, and even Waterton Lakes National Park in Canada. For the best views, however, be prepared to use your feet to help get you around. Day hikes in Glacier National Park can bring you to some amazing locations if you’re willing to stray 5 or 10 miles from the paved roads. For detailed hiking information, check out Hiking in Glacier, which provides a great catalogue of hiking information for the park. For those who aren’t keen on getting a car but would still like a way to hop between locations relatively quickly, Glacier National Park offers a free hop-on, hop-off shuttle service that transports visitors to spots along the Going-to-the-Sun Road. In 2016, the shuttle ran from July 1st until September 5th, with limited service continuing in some locations until September 18th. When it comes to wildlife, be sure to educate yourself before heading into the park. Glacier National Park is home to grizzly bears, black bears, mountain lions, wolves, and more, so educate yourself on how to act if you encounter wildlife. For park-specific information and information on avoiding potentially dangerous situations around wildlife, head over to the Glacier National Park website. Now that all that is out of the way, the following gives a rundown of some can’t miss photo locations in Glacier National Park. Swiftcurrent Lake is located in the Many Glacier area of the park and is easily accessible by car. The shores of the lake next to the Many Glacier hotel face a dramatic view of Mount Wilbur and several other peaks in the Many Glacier area. 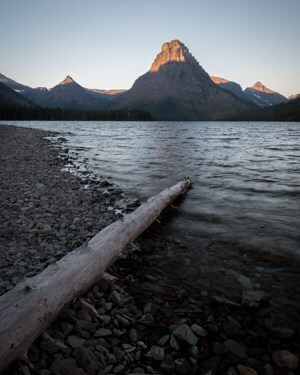 With plenty of shoreline to explore, Swiftcurrent Lake provides opportunities for both landscape and wildlife photos. Any lens from ultra-wide to telephoto could come in useful here, so bring your lens arsenal and get creative. 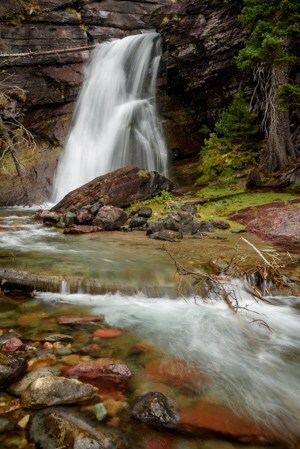 For additional areas around Swiftcurrent Lake that involve a bit more hiking, check out Apakuni Falls or Iceberg Lake. Swiftcurrent Lake is a prime sunrise and sunset location since you face west when looking at the iconic view of Mount Wilbur. On a cloudless morning (like the photo above), beautiful alpenglow illuminates the mountains at sunrise, while an afternoon with clouds can yield a great sunset. Swiftcurrent Lake is one of those prime photo locations that is right off the road. Park in the Many Glacier Hotel parking lot and take the brief walk down the hill towards the shore of the lake. Be sure to allow enough time to get down the road leading to the Many Glacier area, however, since it is in pretty bumpy shape at the time of this writing. 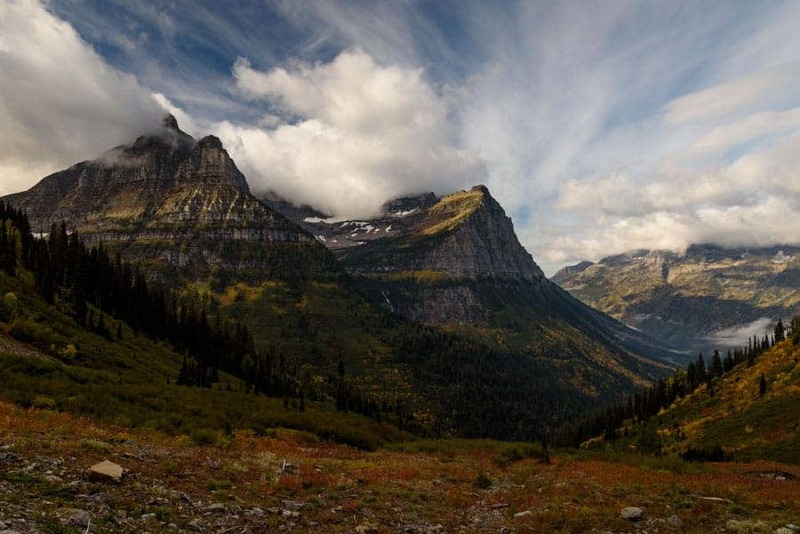 Grinnell Glacier Trail is one of the most beautiful hikes in Glacier National Park. At 11 miles roundtrip and just under 2,000 feet of elevation gain, the hike requires at least an average level of fitness to get to the glacier and lake at the end. The trail is highly rewarding, however, since most of the hike is above treeline, giving you spectacular views of mountains, glaciers, and turquoise lakes. For those afraid of heights, be aware that there are a few sections where the trail gets narrow and hugs a cliff face. However, speaking as someone with a bit of an uneasy feeling towards being up high, I didn’t find the trail to be too unnerving. For those who don’t think they can manage the 11 mile roundtrip hike, you can take boats to shuttle you across Swiftcurrent Lake and Lake Josephine for a fee and cut about 3.4 miles off of the hike. Also, for those who don’t need to hike the whole out-and-back trail, some fantastic views can be had 3 or so miles in from the trailhead. The hike goes through prime grizzy bear habitat, so bring bear spray and make noise on the trail. As for lenses, I found that I kept my 24-120mm on my Nikon D750 the whole hike, which was plenty wide enough for the views from the trail. A telephoto may also be a good idea due to potential wildlife sightings, but consider how much added weight you want to carry on an 11 mile hike. Since many of the views face south from the trail, this hike provides some pretty unfavorable light for a day hike. Sunrise and sunset could provide some beautiful lighting conditions, but only if you’re willing to brave doing some of the hike in the dark. Otherwise, expect to have the sun to contend with like I did while hiking. For best daytime light, leaving in the morning, having a long lunch at the top of the hike, and heading back in the afternoon will keep the sun at your back from much of the trip, giving you some reasonable daytime light to work with in a pinch. The Grinnell Glacier Trail leaves from a roadside parking lot on the west side of Swiftcurrent Lake in the Many Glacier area of the park. The trail is well-marked, so navigating the few forks in your path along the way shouldn’t be difficult. Two Medicine Lake is another great option to consider when you have a hankering for some shots with a lake shore in the foreground and a few dramatic mountains in the background. While the Two Medicine area has plenty of hiking and exploration to be had, there are a couple of satisfying photo location just off the road. The first location is found at the end of Two Medicine Road on the eastern shore of the lake, which offers similar photographic opportunities to that of Swiftcurrent Lake. Bring you wide angle lens for this spot, but also keep a telephoto with you since Two Medicine Valley is has plenty of wildlife to offer. 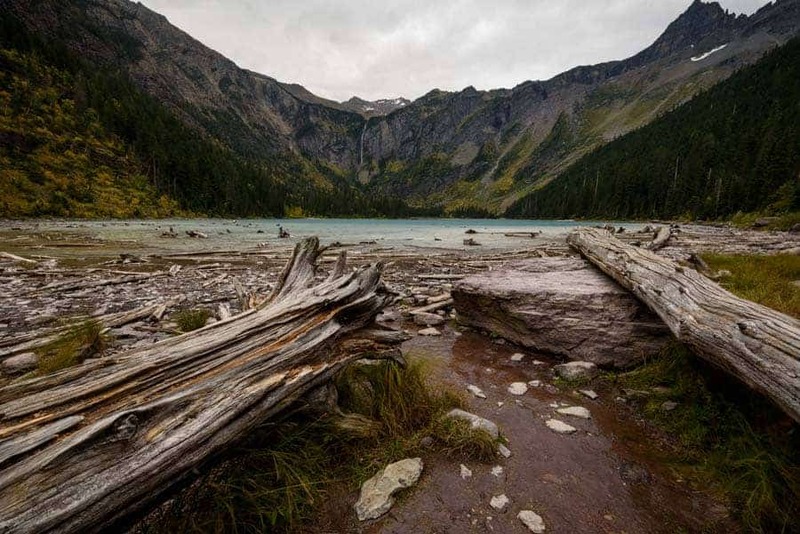 For those who have more time to spend in the area and more spring in their step, a 15.4-mile, strenuous roundtrip hike to Pitamakan Pass offers great views of nearby mountains and several glacial lakes. Route 49, which leads to Two Medicine Road, also has some great viewpoints along the road that offer photo opportunities in early morning or sunset light. As with Swiftcurrent Lake, the time to go to Two Medicine Lake depends on weather conditions. The lake is situated in an east-west direction and the beach at the end of Two Medicine Road is located on the eastern side of the lake. The shot above was taken during a cloudless sunrise when a bit of light illuminated the peaks, but I would have loved to get a late-day sunset shot with dramatic sunlit clouds in the background. Two Medicine Lake is located in the southeastern portion of the park off of Route 49. For those staying in the St. Mary area, the drive to Two Medicine Lake takes about a 50 minutes. 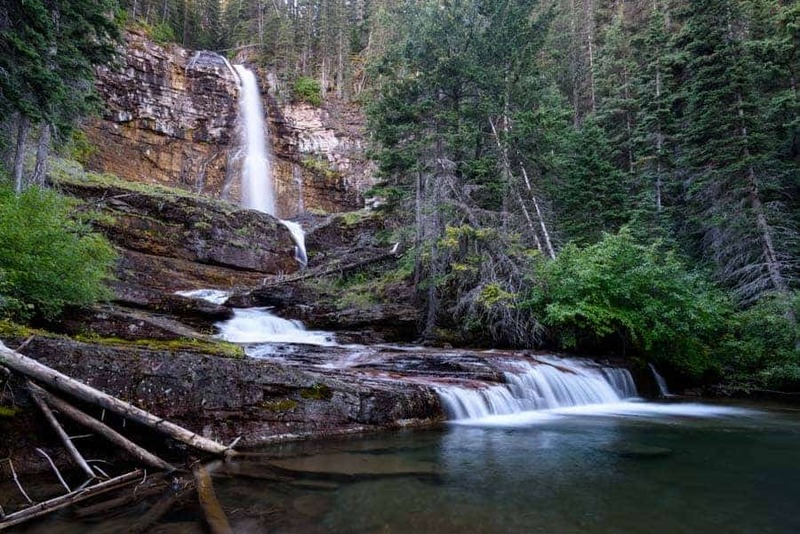 Running Eagle Falls (also known as Trick Falls) is a unique waterfall located a short distance from Two Medicine Lake, so a visit here can easily be paired with a trip to Two Medicine Lake. In time of lower water flows, the falls seem to appear from within a crevasse in the rock face in front of you instead of tumbling over the top of the cliff from above. In times of high water flow, however, a secondary falls flows in a more traditional way over the top of the ledge above. An ultra wide angle lens won’t be need in most cases for Running Eagle Falls unless you want to add some serious foreground and sky to your shot. I took most of my shots at Running Eagle at focal lengths ranging from 24mm to 40mm on a full frame camera. In times of low water flow, however, you may be tempted to wade into the river below the falls to get a unique vantage point, so some waterproof socks and/or waders would be helpful here. When facing Running Eagle Falls, you are also facing west, meaning that in the early part of the day the falls will likely be in full sunlight. I went to the falls a few hours before sunset which, on a day with a few more clouds, would have yielded some nice light filtering into the top of the scene. Depending on the time of year, Running Eagle Falls should be a good afternoon or evening location so that you can get it in shade. Keep in mind that, depending on how much rain or snow melt has occurred in the area prior to your visit, you may get only the “trick” view of the falls (like the photo above). 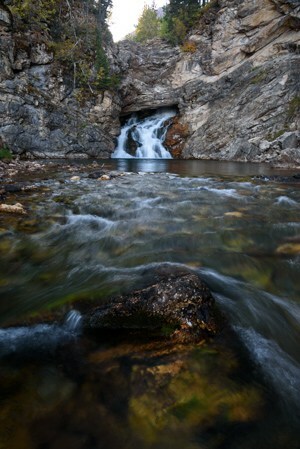 Running Eagle Falls can be accessed by a 0.3-mile trail that begins from a parking lot off of Two Medicine Road. The trail is very accessible, and can be walked by almost anyone. Keep in mind that this could lead to it getting crowded in peak tourist season. The view of Wild Goose Island from the shores of Saint Mary Lake is one of the most iconic viewpoints in Glacier National Park. As a result, be prepared to get a similar photo to many others who have been there before you, but for very good reason. Wild Goose Island is a tiny island that pokes out of the water in Saint Mary Lake and provides an interesting focal point when combined with the grand vista behind it. The classic view of the island is taken from right near the Going-to-the-Sun Road, but don’t forget to explore lower on the shore in hopes of getting a different angle. The classic view of Wild Goose Island doesn’t require much wider than about 24mm on a full frame camera, but you could always go wider to include more of a dramatic sky or the trees in the foreground. The few times I stopped by the viewpoint it was extremely windy, so be sure to have a stable tripod in case the wind whipping off of the lake prevents you from getting a sharp shot even in brighter lighting conditions. From the classic viewpoint for Wild Goose Island you will most likely be facing west-southwest, unless you drive farther west down the Going-to-the-Sun Road to shoot the island from the other direction. From the classic viewpoint, the topography of the surrounding mountains is ideal for sunrises that illuminate the mountain peaks and clouds in front of you. For sunsets in mid-summer, you best hope is to get dramatic side lighting on the mountains in the left side of your frame (and any clouds that might be there) since the sun will set more towards the northwest. On shorter days of the year when the sun sets more towards the west, you may have better chances for a more classic sunset light scenario. 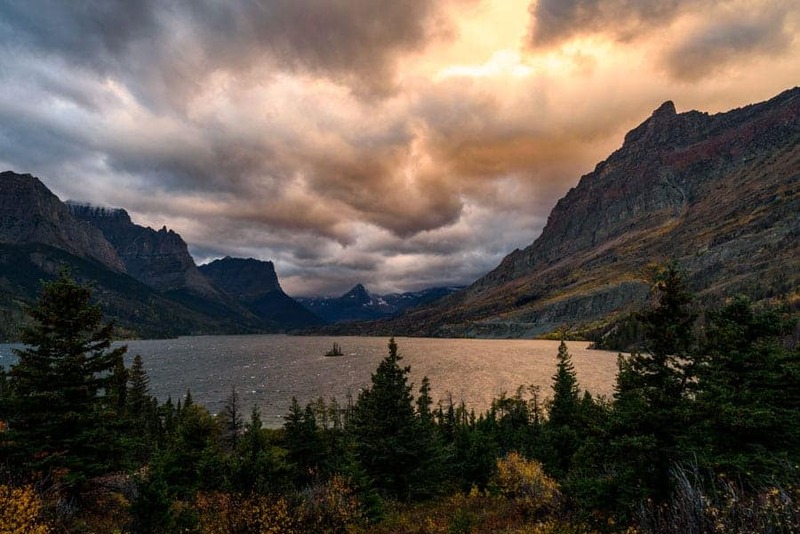 The classic viewpoint for Wild Goose Island is located next to a parking lot along the eastern side of the Going-to-the-Sun Road about a 15-minute drive from both St. Mary and from Logan Pass. There are signs for Wild Goose Island on the side of the road making the viewpoint pretty difficult to miss. Keep in mind that this is a popular location, so during busy season you will want to arrive early to get a spot for sunrise. Baring Falls isn’t my favorite waterfall in Glacier; however, like Running Eagle Falls, it is located fairly close to the road, making it a nice location for those who may not be able to make a long hike. The falls drop about 25 feet into a rocky steam below. Since the falls aren’t too large, 24mm on a full frame camera should be plenty wide. The best times to visit Baring Falls are early morning or late in the day when the falls are in shade. You will be facing a northerly direction when photographing it, meaning that the sun behind you will light up the falls during much of the day. To get to Baring Falls, park in the Sunrift Gorge parking area along the Going-to-the-Sun Road, which is located about a 10 minute drive to the east of Logan Pass. From the parking lot, the trail is a well-marked 0.4-mile walk to reach the falls. While the trail is fairly easy, keep in mind that the trail to the falls is mostly downhill walking away from the road, so there is slightly more effort involved to make it back to your car. The Saint Mary Falls trail is located very close to the Sunrift Gorge parking area from which Baring Falls can be accessed. With a bit more hiking, photographers can gain a much bigger reward that what is offered at Baring Falls. The trail gives you access to Saint Mary Falls, an interesting two-tiered waterfall; Virginia Falls, a tall waterfall with many different possible combinations; and several unnamed cascades along the trail in between these two falls. For Saint Mary Falls, a wide angle lens somewhere in the 24-70mm range on a full frame camera can give you most of the compositions you might want. An ultra-wide might be useful at taller Virginia Falls, however, so consider bringing something as wide as 14mm or 15mm to increase your possible options as you hike further up the trail. You will be facing west when shooting Saint Mary Falls with a big cliff face to your south and a wide open view behind you to the east, so, depending on the time of year, midday and early afternoon are possible options to catch the waterfall while it’s in shade. Virginia Falls, at which you will be facing in a southerly direction, the falls will be in shadows in the mornings and evenings, and possibly during the day depending on how high the sun gets during the time of year that you visit. I did a morning hike when taking my shots at Saint Mary and Virginia Falls, hiking the 1.8 miles to Virginia first before returning to photograph Saint Mary Falls on the way back. The Saint Mary Falls trailhead is located along the Going-to-the-Sun Road a few minutes east of Logan Pass, making it accessible by car or via the free shuttle service. From the parking lot, the trail leads to the south from the Going-to-the-Sun Road and is very well-marked. Saint Mary Falls is located approximately 0.8-miles from the road, and Virginia Falls is located just under one mile beyond that. Lunch Creek is located directly next to the Going-to-the-Sun Road near Logan Pass, making it an easy stop to make. The creek cascades down from Pollock Mountain to the north, providing an opportunity to frame the cascades in the foreground with the mountain top behind. While there is a great set of cascades directly next to the road, the gentle incline of the stream means that you can climb farther up from the road fairly easily to explore many more compositions and viewpoints, as well as escape the crowds. A focal length of 24mm on a full frame was just barely wide enough for a shot of the cascades near the road while still getting Pollock Mountain in the background, so plan on bringing something like a 16-35mm lens on a full frame camera or equivalent unless you are only planning on shooting an intimate scene of the cascades. You will have the sun at your back most of the day when photographing Lunch Creek and Pollock Mountain, meaning that the best times to visit are early morning or late day sunlight before the sun gets too high in the sky. Cloudy days would also be helpful for a trip to Lunch Creek, but keep in mind that overcast skies may also wash out the sky behind Pollock Mountain. Lunch Creek is located along the Going-to-the-Sun Road about one-half mile east of Logan Pass. You can't miss it. Logan Pass is one of the most popular locations in Glacier National Park, and for very good reason. The pass is located at the highest point on the Going-to-the-Sun Road and provides beautiful open views of the surrounding mountains. 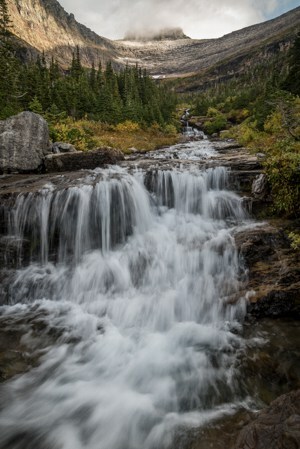 There are countless photographic opportunities from the Logan Pass area, and it also serves as a starting point of various hikes to the surrounding area, including the popular Highline Trail (another great hike to consider for those without a fear of heights). Logan Pass is essentially the do-it-all photography location in Glacier. It provides views of dramatic mountains, Logan Pass meadow, wildflowers, mountain goats, bighorn sheep, bears, and much more. I highly recommend visiting Logan Pass at different times of day and in different light. Bring every lens ranging from ultra wide to telephoto to give yourself plenty of options to photograph whatever catches your eye. My favorite views from the Logan Pass area are from just south of the Logan Pass Visitor Center for a good vantage point of Heavy Runner Mountain and Reynolds Mountain (see the photo above). The parking area at the Logan Pass Visitor Center is far too small, and it remains full for most of the day, especially during peak travel season. Try to head to the pass in the early morning for sunrise or more towards the afternoon once the crowds clear out. Keep in mind that Logan Pass Meadow is typically closed when there is no snow pack, so hiking off-trail during summer and fall is a no-go. Pay attention to posted signs as you wander around the area. Traveling by car is the best way to reach Logan Pass if you are headed there in the morning or evening. For midday visits, however, the free shuttle service may be your best bet due to the lack of parking at the visitor center. Hidden Lake is one of the most picturesque views Glacier has to offer. An overlook for the lake is located about 1.3 miles from the Logan Pass Visitor Center, much of which is by way of a wooden boardwalk. Although the trail to the overlook isn’t too long, keep in mind that you are gaining about 600 feet of elevation in the first two-thirds of the hike. Those who want an up-close view of the lake can continue on down the trail from the overlook, but the best views are arguably from the area near the overlook or just past it. If you don’t mind the weight, bring all of your lenses on the Hidden Lake hike. While the view from the overlook is a grand vista that deserves as wide as 14mm or 15mm, the potential for wildlife along the trail means you should keep a telephoto in your bag as well. While the view of Hidden Lake is spectacular in any light, early morning and late evening really help the view look its best. The view from the overlook faces southwest, meaning that in late summer a trip to the overlook at night helps to get the Milky Way into your frame. Be careful at night, however, since the Logan Pass and Hidden Lake area are prime bear habitat. The trail to Hidden Lake leaves from the Logan Pass Visitor Center. Follow the trail up the wooden boardwalk from the parking lot. It will eventually curve up to the left of Clements Mountain to reach the overlook. Avalanche Lake is a popular 4.5-mile roundtrip hike that leaves from the Going-to-the-Sun Road and connects with the popular Trail of the Cedars. The trail itself to get to Avalanche Lake is worthwhile since it provides several waterfalls and cascades to photograph along the way. The view at the top of the trail at the lake is the real treat, however, where you will find yourself in a bowl surrounded by mountains on three sides. Given how big the landscape is there, an ultra wide lens will be very helpful to have in your bag. The hike to Avalanche Lake is a popular one, so getting to the Trail of the Cedars parking lot early in the day is helpful to ensure that you don’t have to hunt for a parking spot. While there is plenty of room to spread out once you get to the lake, the popularity of the hike means that you will have some people to contend with from mid-morning until later in the evening. The Trail of the Cedars parking lot is located on the Going-to-the-Sun Road near the northeastern end of Lake McDonald. If you don’t get to the parking lot early, your best bet may be to park further west at the Lake McDonald Lodge or Apgar Village and take the free shuttle to the trailhead. Another one of the classic views in the park, the southwestern side of Lake McDonald, provides a foreground with colorful rocks and a view of Glacier’s mountains across the lake. While there aren’t too many compositions to work with, this end of the lake is still worth a stop due to the iconic view. Since the mountains on the far side of the lake are a few miles away, you like won’t need an ultra wide lens in this case. A walkaround lens like a 24-105mm will be versatile enough to allow you to capture both the colorful rocks along the lake shore and the mountains behind, while also letting you zoom in on the mountains for a more intimate view. Since you will be facing northeast from the shore of the lake, this classic shot is good for a summertime sunrise when first light comes from an east-northeast direction. Sunset is also an option, however, because it could provide the possibility of late day glow on the mountain peaks. 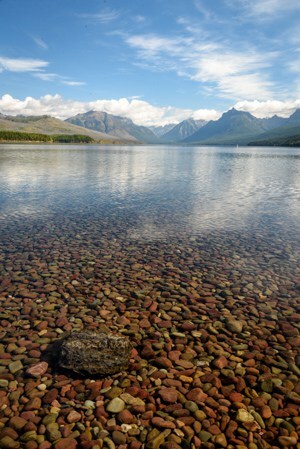 The classic view from Lake McDonald is located in Apgar Village near the beginning of the Going-to-the-Sun Road. It is also a stop along the shuttle route during the season when the shuttle is running. This may seem like a bit of a vague location choice, but the Going-to-the-Sun Road has too many unnamed viewpoints and beautiful scenes to not have its own section in this guide. The road, a National Historic Landmark, slowly winds up into the Rocky Mountains and gives travelers hours of the best views in the park. Driving the road end to end would only take a couple of hours without stopping, but I spent nearly a whole day pulling off at various turnouts to take photos and admire the views. The Going-to-the-Sun Road is a great spot to ignore all of the photography preparation you may have done and allow yourself to explore without much more of a plan than to drive and enjoy. The road showcases many of the best parts of Glacier National Park, and absolutely should be given the attention it is due. Of all of the parks I've visited, Glacier National Park ranks highly among a handful of favorites. The high concentration of beautiful viewpoints and photo opportunities makes it hard to beat. For photographer's that plan to visit, make sure to do your planning before traveling to the park, because once you get there, you won't want to waste a minute.